Now available: annual bibliographies starting in 1960, 1970, 1980, 1990, 2000. See also: 2008 and 2009 and 2011. Announcement, 2010, Evening with Brian [at] Inter Micro 2010, McCrone Research Institute, January. BJF, 2010, Interviewed on the future of food by Rick Wiles, TruNews radio, West Palm Beach, Florida, 1700-1720h Eastern, 27 January. Dexter, Gary, 2010, Explains the origins of Brian J Ford's Nonscience, Daily Telegraph, 31 January. Angel Miguel, 2010, included Brian J Ford recording of neurons [in] El Canto de la Vida: El Lenguaje Musical de los Organismos Vivos, Mexico: Oaxaca, 1900h, 7 February. BJF, 2010, A New Era of Whole Cell Biology, Biologist 57 (1): 9-11, February. BJF, 2010, Single Cell intelligence (with colour photographs), Mensa Magazine: 6-7, February. Amazing Menu of Tomorrow, Illuminations theatre, 1530-1615h, 14 February. Secret Language of Life, Illuminations theatre, 1530-1615h, 20 February. Danger, Expert at Large, Illuminations theatre, 1100-1145h, 21 February. Worst Cruise Videos, and How Not to Make One, Illuminations theatre, 1530-1615h, 23 February. How the Internet can Steal your Identity, Illuminations theatre, 1530-1615h, 26 February. 6. Will the world end in 2012? 7.What exactly is kinetic energy? Illuminations theatre, 1530-1615h, 1 March. Also: television interview by Paul O'Loughlin, Morning Programme (video file in archive): 20 February. Sailing: Hong Kong, China; Shanghai, China; Nagasaki, Japan; Yokohama, Japan; Hagåtaña, Guam, Mariana Islands; Rabaul, Papua New Guinea; Airlie Beach, Whitsunday Islands, Australia; Auckland, New Zealand; Paihia, Bay of Islands, New Zealand; Sydney, Australia. 13 February - 8 March. Aur, Dorian and Jog, Mandar S., 2010, cite Brian J Ford [in] Neuroelectrodynamics, Understanding the Brain language: 7, 21, 208, 231. Amsterdam and Washington DC: IOS Press, February. Hudson, Ian P, 2010, Use of words under the microscope (with colour picture), Mensa Magazine: 17, April. BJF, 2010, The Secret Power of the Single Cell, New Scientist 26-27, 24 April. Report, 2012, Neurons not a switch, Quantum Mind report, April. BJF, 2010, Word Wise (response to Ian Hudson, vide supra), Mensa Magazine: 17, May. 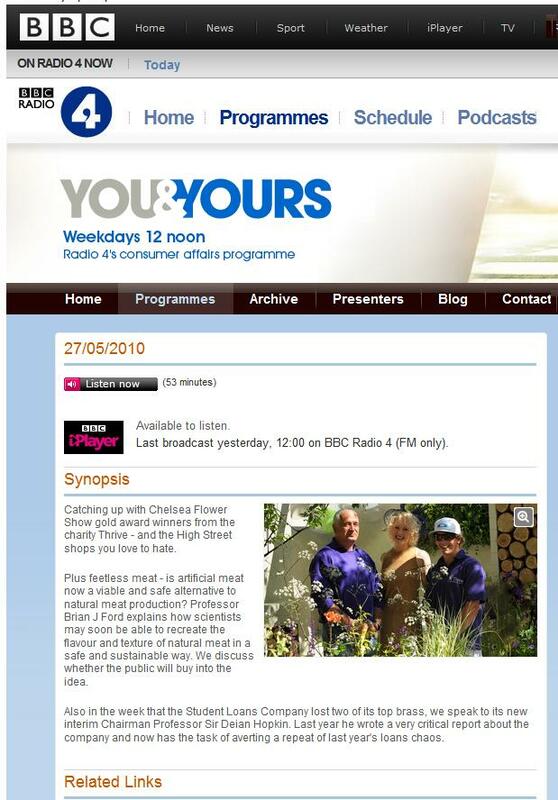 BJF, Interviewed by Winifred Robinson on cultured meat, You and Yours, BBC Radio Four, 1245-1250h, 27 May. Laughlin, Gary, 2010, editorial introducing Brian J Ford's new column Critical Focus, The Microscope 58 (1): 2. BJF, 2010, Critical Focus column (1): The Royal Society turns 350, The Microscope 58: 35-40. BJF, 2010, The Cheat and the Microscope - Plagiarism over the Centuries, The Microscope 58 (1): 21-32. Announcement, 2010, Brian J Ford to present keynote at Inter Micro, Chicago, The Microscope 58 (1): 44. Robinson, Winifred, 2010, interviews Brian J Ford on cultured meat, BBC You and Yours, Radio Four, 1245-1250h, 27 May. Henderson, Mark, 2010, guest blog by Brian J Ford on cultured meat for the Times, 2 June. Exley, Stephen, 2010, article on Brian J Ford cultured meat chapter, Cambridge News, 2 June. An Evening with Brian: Censoring the Cell - how the Microscope is abused by the Media, 1900-2000h, 12 July. How Microscopic Particles Shut Down the Airways, 1130-1150h 13 July. The Microscope and the Royal Society, 1415-1435h, 14 July. Papworth, Andrew, 2010, Could this be Whittlesey’s oldest resident? Cambridge Times, 20 August. BJF, 2010, Thirty Years of Mensa at Cambridge, after-dinner speech, Mensa gala dinner, Sidney Sussex College, Cambridge University, 2030-2110h, 21 August. BJF, 2010, Concerning the Abilities of Living Cells, illustrated presentation to Mensa at Cambridge, Sidney Sussex College, Cambridge University, 1400-1530h, 22 August. BJF, 2010, address on cultured meat to Vegetarian Society debate at annual meeting, London: Dragon Hall, Covent Garden, 1630h, 11 September. Lebbad, Marianne, 2010, Includes single-lens study of Giardia [in] defence of thesis: Molecular Diagnosis and Characterization of Two Intestinal Protozoa: Entamoeba histolytica and Giardia intestinalis. Department of Parasitology, Mycology and Water, Swedish Institute for Infectious Disease Control, 24 September. BJF, 2010, Critical Focus column (2): Inventing Life, or Reality?, The Microscope 58: 35-40. The Secret Language of Life, Illuminations Theatre, 1530h, 21 September. What you need to know about the Internet, Illuminations Theatre, 1115h, 22 September. 2. Can intelligent life exit without a body? 7. Do germs stay on soap? 8. How does gravity work? 9. What would I want to find at the bottom of the deep abyss? 10. How long will it take for wind power to repay carbon footprint? Illuminations Theatre, 1530h, 30 September. Also: Book signing, 1215h, 22 September; 1630h, 21 September; 1630h, 30 September. Interviwed by Ray Rouse on The Breakfast Show, 22 and 30 September (recordings on file). Sailing: Southampton, UK - Barcelona, Spain - Monte Carlo, France - Civitavecchia (for Rome), Italy - Naples, Italy - Gibraltar - Lisbon, Portugal - Southampton, UK. 19 September - 1 October. BJF, 2010, The Physiology of Autumn, Presidential address to Cambridge Society for the Application of Research, Churchill College Cambridge, 1900-2100h, 18 October. Announcement, 2010, Revolutionary Insights - the Dawn of Microscopical Investigation, illustrated presentation wth videomicrographs to the Royal Society, 1330-1430h, 29 October. Exley, Stephen, 2010, Why trees really dump their leaves, Cambridge News, 23 October. Report, 2010, Scientist discovers why trees really lose their leaves in autumn, Daily Telegraph: 15, 25 October. BJF, 2010, Revolutionary Insights - the Dawn of Microscopical Investigation, illustrated presentation with videomicrographs to the Royal Society, 1330-1430h, 29 October. BJF, 2010, review of Darwin, the Concise Story of an Extraordinary Man, Biological Journal of the Linnean Society, 101: 1002. Report, 2010, Brian J Ford theory on autumn leaves [in] Autumnwatch, BBC Television, 11 November. 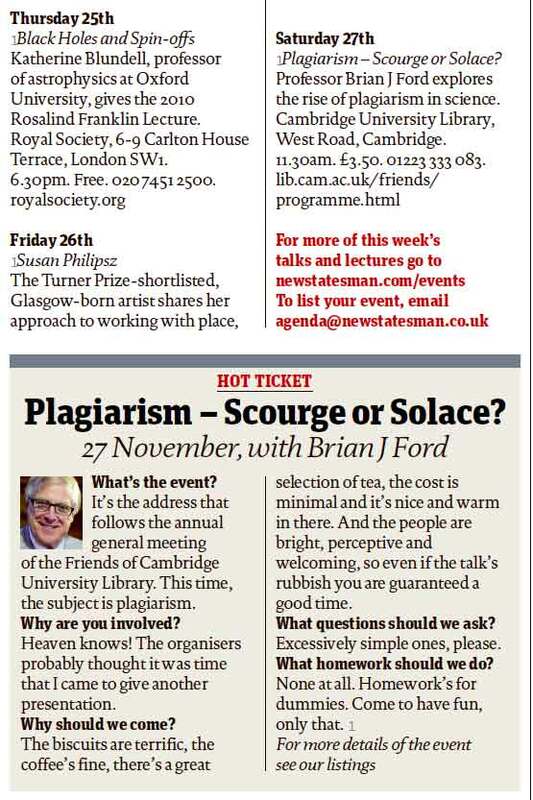 Crampton, Caroline, 2010, interviews Brian J Ford on forthcming plagiarism lecture for New Statesman: 38, 22 November. BJF, 2010, Plagiarism, Scourge or Solace? illustrated presentation to the Friends of the University Library, Camvbridge University, 27 November. BJF, 2010, Critical Focus column (3): Censoring the Cell, how the Microscope is abused by the Media, The Microscope 58 (3): 121-129. BJF, 2010, reviews Samuel Fallours, Facsimile of Tropical Fishes of the East Indies, Cologne: Raschen, Zoological Journal of the Linnean Society (in press). BJF, 2010, reviews The Quest for the Invisible - Microscopy in the Enlightenment, by Marc. J Radcliffe, ISBN 978-0-7546-6150-4, xii + 315 pp, Farnham, Surrey: Ashgate Publishing, Biologist (in press). BJF, 2010, reviews The World of Carolus Clusius: Natural History in the Making, 1550-1610 by Florike Egmond. ISBN-10: 1848930089, ISBN-13: 978-1848930087, 312 pages, London: Pickering & Chatto Ltd, Biologist (in press). BJF, 2010, reviews Charles Darwin, the Concise Story of an Extraordinary Man, by Tim Berra, Baltimore: Johns Hopkins University Press, 2009, Linnean Society (in press). Mystery of the Christmas Snowflake, Neptune Lounge, 1100h, 22 December. A Scientist looks at Christmas, Neptune Lounge, 1500h, 24 December. Danger - Expert at Large, Neptune Lounge, 1500h, 1 January 2011. 2. Religion: a force for good? 4. Could we exist without chemicals? 8. Is global warming man-made? Neptune Lounge, 1000h, 4 January 2011. Sailing: Southampton, UK - Lisbon, Portugal - Arrecife, Lanzarote - Puerto del Rosario, Fuerteventura - Las Palmas de Gran Canaria, Canary Islands - Santa Cruz de Tenerife, Canary Islands - Santa Cruz de la Palma, Canary Islands - Funchal, Madeira - Southampton, UK. 21 December 2010 - 5 January 2011. Return to previous year, 2009 or move to next year, 2011.